This article went out in my newsletter a couple of weeks ago, but I've had so many requests that I thought I'd publish it here too. Enjoy! Since moving to Paris five years ago and launching Rue Rodier, Instagram has become a big part of my life. Like getting dressed in the morning, there’s not a day that doesn’t go by when I don’t check the app. And with the launch of Stories in August 2016, the amount of time I spend in this space has only increased – although I try to carve out segments in my day to spend there rather than look at the app every time I have a spare moment – very easy to do, believe me. Admittedly there are days that I want complete anonymity in my daily comings and goings. But on other days (when I'm travelling or doing something a little more interesting than working from home), I relish publishing my own reality TV show. But either way, I do try to bring a bit of artistic license to my Stories. So I’ve sought out a few apps that help me be a little more creative in the Stories sphere. 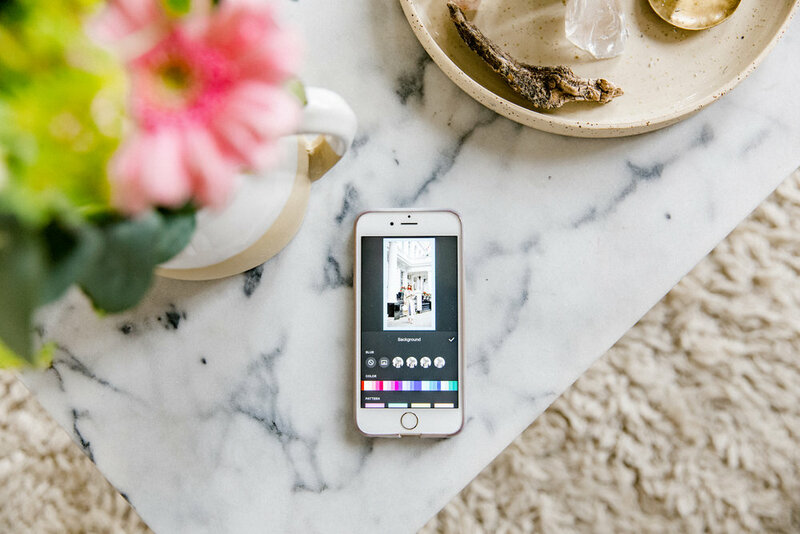 This is the app I use to edit most of my Stories – it allows you to create boarders in different colours around your images and videos, crop photos and trim videos, as well as create collages. And you can move visuals around inside the canvas and make them any size you want. You might remember this app from older Instagram days, when you wanted to add text over an image. You can still do this, but you can also overlay images too. Great for creating collages or building a story from your images. I’m sure you’ve seen the videos with seemingly extra sparkle. That’ll be kirakira+. It creates a filter that adds diamond-like sparkle to everything. Great if you’re showcasing jewellery or wearing a sequin dress, or just want to add a bit of extra bling. Wordswag as you might guess from the name is a bank of cool backgrounds and fonts. It’s how I create my marble backgrounds and fancy fonts that I've used to promote articles on Rue Rodier. This is a another good source for typography, but with a twist. This app animates your words - hence the 'hype'. You can choose different fonts and colours and then they are animated to move across your screen when posting. I first started using Instagram about six-seven years ago (!) and I’ve been highly active for around four years. In the past two years it has become a part of my business, a source of income and a huge part of my life. I've even met some of my best friends on the app. It was a great way to meet like-minded people when I first moved to Paris and it has continued to connect me with fellow creatives, photographers and bloggers. Over the years, I’ve picked up a few tips and tricks along the way, which I thought I’d share with you all to help make the way you use Instagram a little more smoother, creative, inspiring and most importantly healthy! I know this is an obvious one, but it is key to creating a beautiful likeable account. A phrase you might have heard is: "Content is King" - it really is, in all aspects of life and business. Unless you're a celebrity, people are more likely to follow you because you have created a beautifully-curated and thoughtful feed. So upgrade your photography skills, chase the light, learn how to edit and find an aesthetic that you can adhere to, so followers old and new can recognise one of your photos when they come through the feed. Another phrase I'm sure you’ve all heard is: “comparison is the thief of joy”? Well it is, so do your best not to compare yourself to others. Of course we are naturally competitive as humans and with competition comes comparison, but those that can compare less will go further in life and in their careers. I know it can be hard not to sometimes, I am of course guilty of it, but believe me it doesn’t help drive you forward and reach your goals if you spend your time comparing yourself to others - the way they look, the followers they have and the way they run their lives. And you never really know what is going on behind the scenes. Even with the introduction of Stories 1.5 years ago, what people portray online is still an edited version of their life. Therefore keep your eyes on the prize. Concentrate on your own creativity and content creation - this will not only assist your creativity, but it will give an edge over everyone else. Don’t know how to do something? Need more photography or editing skills? Take an online course – Skillshare and Creative Live are great for photography courses. If you don’t want to pay, Youtube has millions of free tutorials. I know Instagram has morphed from a focus on community and creativity to an advertising channel for brands. BUT, community is still so important and key to the app's existence. It’s still there and it’s not going away any time soon, thank goodness. So, there’s no point in putting your posts out there without engaging and chatting with others. I’ve always figured if someone can take the time to leave a nice comment, then I can take the time to reply. So leave comments, engage, chat - say if you like something and the more you chatter, this also helps raise your engagement levels and go someway to beating the algorithm. Don't just post a photo and leave the app, you need to hang around for a while, answer comments and create a rapport with your community and the people you follow. I tend to edit most of my Instagram posts on Lightroom now, as I shoot most my photos with my Canon 6D – mainly so I can I have the high res images, should I need them for ruerodier.com. But I used to use VSCO, Afterlight, Snapseed and Facetune (I still use the 'details' tool to bring out aspects of a photo). Presets are also a brilliant tool to keep your aesthetics consistent. I recommend VSCO Presets or if you a whizz at editing, create your own. I've finally found my favourite settings with a lot of trial and error which I've created into my own preset on Lightroom. Also an obvious point, but it's imperative to maximise your engagement potential. There is no point posting an image when half your audience is asleep. This might be the case if you have a lot of followers on a different timezone. I use Instagram Insights, to see when the best time for me is to post. If you don't have a business account or access to Insights, you can also use an app called, WhenToPost and you can also schedule posts with Planoly. Post everyday, twice a day if you can. And publish to Stories as often as you can. The way that Instagram and its algorithm now works, is it is more likely to push to the forefront accounts that are very active. Know what you are trying to achieve with Instagram. Do you want to promote your business, become a blogger, are you a photographer? Or are you there, just to observe - this will help you know how hard to work with and utilise the app. If you do want to promote your business, you will need a strategy. Read as much as you can about how Instagram functions. And finally, be you. Oscar Wilde put it very succinctly when he said: "Be yourself, everyone else is taken." What makes you tick? What kind of content do you want to create? Don't be a copycat - find an aesthetic and photograph topics that suit you and your interests. Is it fashion, travel or interiors, for example? It's taken me a long time to find my groove so to speak with my aesthetics, but I've always known the kind of content I want to post as they are in line with my interests and experience. I hope you’ve found this helpful! What tricks and tools do you use for Instagram?